B.B. Engineering Pty. Ltd. was established 25 years ago and is equipped with a comprehensive range of modern precision machine tools. We are located just 15 minutes from Melbourne International Airport and the CBD. Our 3,000 sq/m site is climate controlled to enable 24 our operation when required with a safe and sustainable working environment for our employees. We are able to incorporate a flexible manufacturing system which enables small to large batch production of precision components. A proven track record in the Aerospace, Defence, Medical and Commercial fields, and it can be relied upon for the best service and performance needed to maximize and compliment client needs and services. B.B. Engineering Pty Ltd also offer a fully complemented toolroom for the design and manufacture of Jigs, Fixtures and Special Tooling applications combined with a Test and Assembly facility to encompass all client Engineering requirements. With AS/NZS ISO 9001:2008 accreditation certified by Quality Assurance and regular audits. B.B. 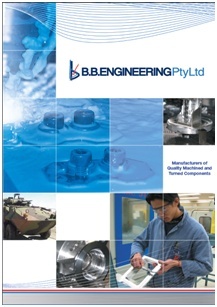 Engineering Pty Ltd is dedicated to continual improvement in both its processes and internal systems. The company’s Quality System can be configured to suit any client’s needs; instilling confidence and reliability to maintain the competitive edge. As an innovator within the industry, B.B. Engineering Pty Ltd have and accept, the responsibility to its clients, its employees and the industry as a whole to maintain the highest standards of quality in the products and services that it provides.